FINALLY…. 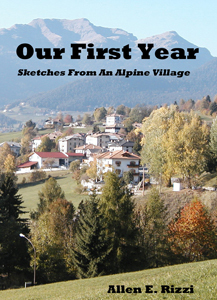 my book, Our First Year – Sketches from an Alpine Village, is available as an audio book from audible.com, amazon.com and iTunes. Tom Holloway did a great job with the narration and we’re both proud of the finished product. Our First Year – Sketches From An Alpine Village tells about living in Italy as Americans through several often humorous sketches. The people, places and languages are explored giving the reader a true picture of what it’s like to live in Italy on a daily basis. Thanks to all of my readers who have patiently awaited this release. I think you will really enjoy the audio version.